Travel to Cuba. Hotel and vacations in Cuba. CubaHotelTravels.com is a travel agency that offers the best prices to book hotel rooms in Cuba, since we work jointly in contact with the hotels, tour-operators and suppliers. We offer accommodations and reservations on line for more than 250 hotels in several tourist destinations in Cuba, many of them managed by famous hotel chains (Meliá Internacional, H10 Hotels, Iberostar Hotels, Blau Hoteles, Barceló Hotels, Accor, Cubanacán, Playa among others). We offer also de luxe, inexpensive and all-inclusive hotels in cities, beaches and in nature and history tourist destinations. CubaHotelTravels.com is implicated in the provision of services with quality and in the satisfaction of the requirements and the highest expectations of our customers. Book on line with us and we guarantee satisfaction and also you will save money and time. Your travel to Cuba with us is simpler, because we are always attentive to your needs. We have a qualified staff that will offer you all the adequate information in the right minute. Booking with us is a guarantee for your travel and stay in Cuba. We offer the best hotels in the country and the most competitive prices in the tourist market. With CubaHotelTravels.com you will obtain the best advices when traveling to Cuba, and also informations about the money exchange and other matters of great importance. Visit our frequent questions page and you will be totally informed. You can contact with us at any time, for us is a great pleasure to help you. 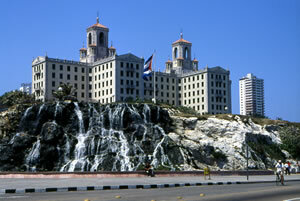 Some of the hotels in Cuba more reserved and visiting by our web users. Cuba is a magical island bathed in waters of the Caribbean Sea. Its cities, nature and people invite to travel from the Eastern part to the Western. Explore with us all the options you have for you to delight in watching. Through our web CubaHotelTravels.com you can give a memorable vacation to your family in Cuba. Your family can get a hotel voucher thanks to you! You just only need to select a hotel, fill out a reservation form on behalf of the person whom you will give the surprise. We will send you a payment way and that´s all! Once you have paid the hotel we will send you the hotel voucher for you to give it to your family. They must show the voucher upon arrival at the hotel as proof of its reservation through our travel agency.